Alexander Forbes Financial Services provides expert employee benefits consulting, actuarial, investment and administration services. We service multinational and local companies and give holistic financial planning advice to individual clients. Top-class consultants look after your retirement fund, its members, its investments, your health offering and your employees' general financial well-being. Alexander Forbes Healthcare Consultants provides excellent quality medical aid brokerage services to both employers and their employees alike. Our commitment is to ensuring the right plan, with the right benefits and appropriate service levels, is in place. Investment Solutions is the largest multimanager investment company in sub-Saharan Africa. Their investment management products complement the research and best practice of Alexander Forbes Financial Services. As you move through life, your wealth and assets grow. Alexander Forbes has the best insurance solutions to protect what matters most to you at every stage of your life. Alexander Forbes Insurance offers motor and household, building and business insurance to individuals and to small and medium-sized businesses. 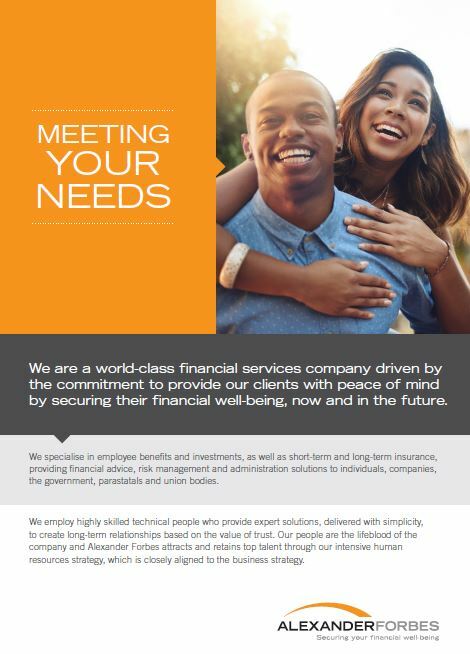 Alexander Forbes Life specialises in providing uniquely tailored long-term insurance solutions to individuals and to employees, through their companies. Alexander Forbes Financial Planning Consultants brings quality financial planning services to the individual. We are committed to supporting each client every step of the way on their financial journey. Rooted in Africa, yet globally distinctive, we create wealth and protect our clients' assets. Emerging Markets offers employee benefits, actuarial and investment consulting and retirement fund administration services to corporate and institutional clients, as well as the public sector in Namibia, Botswana and Kenya. We also have a market-leading presence in Nigeria, Zambia and Uganda. COMMENT ON THE PROPOSED AMENDMENT OF THE REGULATIONS TO THE SHORT-TERM INSURANCE ACT 1998, AS AMENDED. A range of products to meet your short-term insurance needs. Expert financial planning advice you can trust.